Today we are awash in computerized Bible games, pastoral care software, and church management systems with members' personal information and giving records, observe authors Spiegel, Armstrong, and Bill, but too often we blindly accept and use technology without asking the big questions. Questions like, is it appropriate to our mission and ministry? 40 Days and 40 Bytes will help your congregation … explore technology so you can decide, from a ministry and culture standpoint, what you need to do. The goal: godly servicenot technological glitz. The authors are uniquely qualified to help you think about the role of technology in your congregation. All three are staff members with the Indianapolis Center for Congregations, which launched the innovative Computers and Ministry Grants Initiative in 1998 to help congregations address the challenges they face when using computer technology in their ministries. In this book, they share what they have learned in their work with 102 congregations. There's no question your congregation is going to use computer technology. The only question is, How? 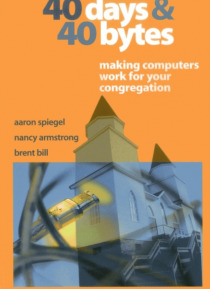 40 Days and 40 Bytes will help you design technology that fits your ministry and mission.